According to a report recently published by the World Bank, the economies of the Middle East, central Asia and Africa will suffer severe economic losses by the middle of the century due to intense water scarcity. Climate change, demographic shifts and increasing urbanisation will create a demand for water that will, if water resource management remains unchanged, result in increased water scarcity in areas that do not currently have an issue with water supply and greatly exacerbate the problem in regions where water is already in short supply. This water stress will then significantly impact the future economic growth of these areas, as key sectors such as agriculture and health will be affected. 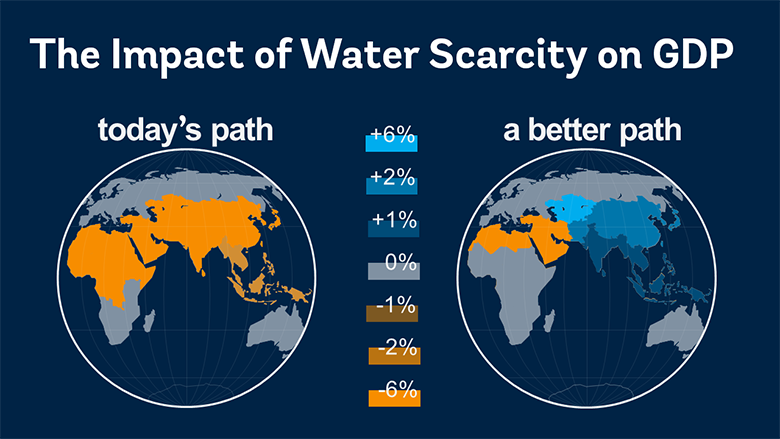 Economic growth relies on stable water supplies, and areas such as East Asia could see their growth rates decline by almost 6% of GDP within the next 40 years. For regions such as the Middle East and the Sahel in Africa, economic growth could decline by even more: the report predicts that the Middle East could lose 14% of its GDP and the Sahel nearly 12%. Despite these stark warnings, there are still measures that can be taken to forestall this rather bleak prediction. If governments improve water resource management policies, predicted growth rates could instead improve by up to 6%. According to the Bank's Lead Economist, "when governments respond to water shortages by boosting efficiency and allocating even 25% or water to more highly-valued uses, losses decline dramatically and for some regions may even vanish. Improved water stewardship pays high economic dividends." The report also tellingly links water to the future success of the Sustainable Development Goals, stating that "water is the common currency which links nearly every SDG, and it will be a critical determinant of success." Smart governmental policies are the crucial method for negating climate change's impact on the global economy and for achieving developmental success. For more information, read the Executive summary or download the report itself here.